The true story of Argentina's infamous Puccio family. The Clan is a superficial telling of what should be an interesting tale, more interested in aping Goodfellas, as so many mediocre true crime dramas are wont to do, than getting under the grubby fingernails of its subjects. Argentine cinema has recently been engaged in examining the darker aspects of that country's distant and recent past - from the indigenous genocide of the late 19th century in Jauja, to the sheltering of Nazi war criminals in Wakolda, to the crimes of the country's 1970s military dictatorship in The Secret in Their Eyes. 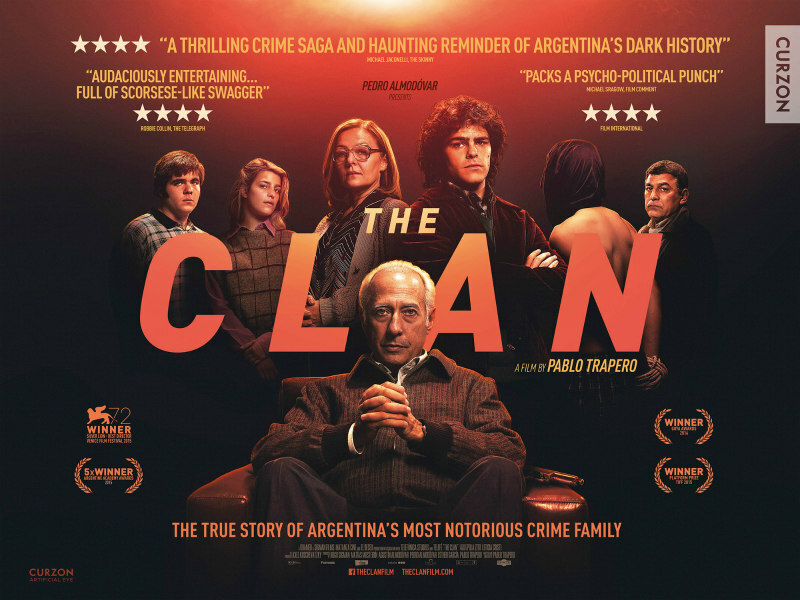 The Clan deals with the fallout of the latter, an account of the crimes of the Puccio family, who ran a notorious campaign of kidnapping and murder in the post-junta mid-80s. The head of the family is Arquímedes (Guillermo Francella, resembling the corpse of Dustin Hoffman), a former enforcer for the dictatorship who finds himself out of work when his country turns to democracy. Using his skills, he embarks on a new career as a kidnapper, beginning with the abduction and subsequent execution of a friend of his son Alejandro (Peter Lanzani). The film positions Alejandro as its central protagonist, exploring his dilemma of being torn between loyalty to his father while wrestling with his conscience. I'm no expert on Argentine history, but I suspect writer-director Pablo Trapero is employing this father-son dynamic as an allegory for the situation his country found itself in during the rebirth of democracy after the Falklands War, a time when the progressive younger generation no doubt would have found themselves at political odds with their conservative parents. Along with familial loyalty, Alejandro also finds himself financially rewarded, or paid off, by his father, using the money to set up a surf shop. It's the old problem faced by all teenagers - how to challenge the views of the person keeping a roof over your head and putting food in your belly. But the film never really delves into this relationship in any depth, and only a late explosion of violence between the two men gives us a satisfying glimpse of their volatile relationship. The Clan is a superficial telling of what should be an interesting tale, more interested in aping Goodfellas, as so many mediocre true crime dramas are wont to do, than getting under the grubby fingernails of its subjects. The kidnapping set-pieces are accompanied by ironic pop music, which feels tonally at odds with much of the film's drama, and pays little respect to the victims involved. And what of the women in the Puccio clan? With Arquímedes' wife and daughters reduced to mere set dressing, the film fails to establish how they felt about the situation, or even how aware they were of their patriarch's actions. If you're looking for an involving drama, The Clan is deeply unsatisfying. Those with an appreciation for camera trickery will find some reward here however, with several "how the hell did they pull that off?" moments, in particular a shocking suicide attempt that will have you instantly rewinding the scene (should you watch it at home) in an attempt to see the strings. When it comes to alchemic Argentine filmmaking, it's a moment that stands alongside the stadium sequence of The Secret in Their Eyes or the Viggo Mortensen twin effects of Everybody Has a Plan; if only the movie had borrowed an ounce of the drama of either of those films. The Clan is in cinemas September 16th.